Edward Gibbon (8 May 1737 – 16 January 1794) was an English historian and Member of Parliament. His most important work, The History of the Decline and Fall of the Roman Empire, was published in six volumes between 1776 and 1788. The Decline and Fall is known for the quality and irony of its prose, its use of primary sources, and its open criticism of organised religion. Gibbon returned to England in June 1765. His father died in 1770, and after tending to the estate, which was by no means in good condition, there remained quite enough for Gibbon to settle fashionably in London at 7 Bentinck Street, independent of financial concerns. By February 1773, he was writing in earnest, but not without the occasional self-imposed distraction. 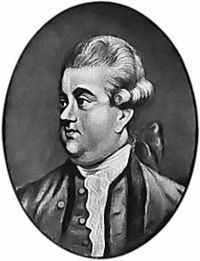 He took Edward Gibbon (8 May 1737 – 16 January 1794) was an English historian and Member of Parliament. His most important work, The History of the Decline and Fall of the Roman Empire, was published in six volumes between 1776 and 1788. The Decline and Fall is known for the quality and irony of its prose, its use of primary sources, and its open criticism of organised religion. Gibbon returned to England in June 1765. His father died in 1770, and after tending to the estate, which was by no means in good condition, there remained quite enough for Gibbon to settle fashionably in London at 7 Bentinck Street, independent of financial concerns. By February 1773, he was writing in earnest, but not without the occasional self-imposed distraction. He took to London society quite easily, and joined the better social clubs, including Dr. Johnson's Literary Club, and looked in from time to time on his friend Holroyd in Sussex. He succeeded Oliver Goldsmith at the Royal Academy as 'professor in ancient history' (honorary but prestigious). In late 1774, he was initiated a freemason of the Premier Grand Lodge of England. And, perhaps least productively in that same year, he was returned to the House of Commons for Liskeard, Cornwall through the intervention of his relative and patron, Edward Eliot. He became the archetypal back-bencher, benignly "mute" and "indifferent," his support of the Whig ministry invariably automatic. Gibbon's indolence in that position, perhaps fully intentional, subtracted little from the progress of his writing. 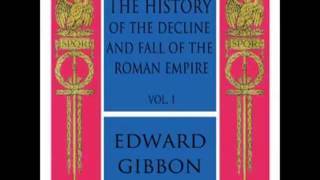 After several rewrites, with Gibbon "often tempted to throw away the labours of seven years," the first volume of what would become his life's major achievement, The History of the Decline and Fall of the Roman Empire, was published on 17 February 1776. Through 1777, the reading public eagerly consumed three editions for which Gibbon was rewarded handsomely: two-thirds of the profits amounting to approximately £1,000. Biographer Leslie Stephen wrote that thereafter, "His fame was as rapid as it has been lasting." And as regards this first volume, "Some warm praise from David Hume overpaid the labour of ten years." It was on the day, or rather the night, of 27 June 1787, between the hours of eleven and twelve, that I wrote the last lines of the last page in a summer-house in my garden. ... I will not dissemble the first emotions of joy on the recovery of my freedom, and perhaps the establishment of my fame. But my pride was soon humbled, and a sober melancholy was spread over my mind by the idea that I had taken my everlasting leave of an old and agreeable companion, and that, whatsoever might be the future date of my history, the life of the historian must be short and precarious. What should the Literary Horror group pick for its May, 2015 monthly read?